Are you thinking about purchasing an SUV? Here at Rimrock Kia, we like to keep our consumers informed, so you can read below to find out why you should consider an SUV as your next vehicle. 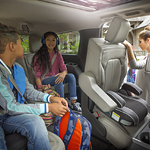 SUVs offer ample space, which is why many consumers with large families choose these models. Many SUVs offer third-row seating and plenty of cargo space. They are also beneficial for pet owners. Letting pets roam freely throughout the cabin of a vehicle is unsafe, but SUVs provide pet owners with plenty of room for pet carriers. SUVs provide you with better off-road and towing capability. SUVs typically have advanced towing features that let you easily transport motorcycles, boats, and campers. Because SUVs have sturdy suspension systems and higher ground clearance, they offer enhanced off-road capabilities. Furthermore, many of them come equipped with features such as hill descent control and traction management, which also boost off-road performance.